Cameras are used frequently in iOS applications, and the addition of CoreML and Vision to iOS 11 has precipitated a rash of applications that perform live object recognition from images - whether from a still image or via a camera feed. Writing AVFoundation code can be fun, if not sometimes interesting. 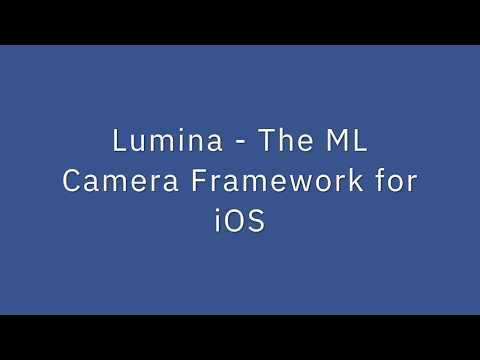 Lumina gives you an opportunity to skip having to write AVFoundation code, and gives you the tools you need to do anything you need with a camera you've already built. David Okun has experience working with image processing, and he thought it would be a nice thing to have a camera module that allows you to stream images, capture photos and videos, and have a module that lets you plug in a CoreML model, and it streams the object predictions back to you alongside the video frames. Small note: If editing the README, please conform to the standard-readme specification. NB: Lumina does not currently build with Swift Package Manager due to a lack of support for frameworks that require UIKit. Nonetheless, as SPM evolves, Lumina will be ready to support it! NB: As the Swift Package Manager continues to grow, please view its documentation here. Clone or download this repository, and use the provided workspace to build a version of the library for your own use in any application. NB: This repository contains a sample application. This application is designed to demonstrate the entire feature set of the library. We recommend trying this application out. Remember to add a description for Privacy - Camera Usage Description and Privacy - Microphone Usage Description in your Info.plist file, so that system permissions are handled properly. Lumina allows you to set a level of logging for actions happening within the module. The logger in use is HeliumLogger, made by the Swift@IBM team. The deeper your level of logging, the more you'll see in your console. NB: While Lumina is licensed by the MIT license, swift-log is licensed by Apache 2.0. A copy of the license is also included in the source code. NB: This only works for iOS 11.0 and up. You must have a CoreML compatible model(s) to try this. Ensure that you drag the model file(s) into your project file, and add it to your current application target. You are now set up to perform live video object recognition. Because the functionality of the camera can be updated at runtime, all delegate functions are required. // depth data must be manually cast to AVDepthData, as AVDepthData is only available in iOS 11.0 or higher. NB: It's import to note that, if you are in video recording mode with Lumina, streaming frames is not possible. In order to enable frame streaming, you must set .recordsVideo to false, and .streamFrames to true. Note that this returns a class type representation associated with the detected results. The example above also makes use of the built-in text prompt mechanism for Lumina. Per default, all of the buttons are visible. Camera now has one constructor with one parameter, text view can be used at any time. Support for iOS 10.0 and above.